One thing that still messes with my mind as someone who’s moved from the UK to Australia…. seasons. Having them reversed, and therefore associated completely differently to the labels we apply to calendar months still throws me into the occasional confusion. It just isn’t winter in August! (In my mind at least). And this view of Musgrave Park on my walk home from parkrun this morning did not help with the confusion, even if it did add a massive grin to my face. It’s winter here…heading into spring. Yet this scene of trees surrounded by their dropped and browned leaves is straight out of my Autumn memories bank. And actually, I think I really liked a UK like Autumn. Those random sun lit days with a bit of cold in the air, the changing scenery as the plants and trees starting preparing themselves for winter. The simple joy of stomping/ kicking/ walking/ running through piles of leaves. What seasons do you like….and why? Daily Photo – Thursday 27th August 2015 – Look up or down? Don’t know about you, but I noticed there was a recent trend of articles, videos and social media posts encouraging people to look up from their gadgets and experience the world around them. Whilst walking along Adelaide Street today in Brisbane I noticed this…. ..embedded in the footpath it made me smile. Because actually you’ve got to be looking down to notice it. And then further along the street I noticed this…. 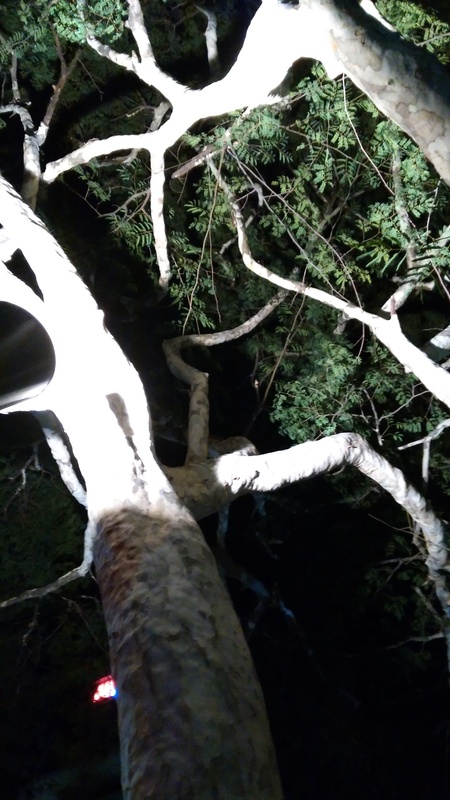 …that little logo placed in the corner of that tree grate thingy, is actually the logo commonly associated with Brisbane, used by Brisbane City Council. It represents the City Hall building. And that lovely looking building will no doubt feature in posts on here now and in the future. Just search my tags for ‘City Hall’ if you’re interested. I don’t actually like this photo. My fault for taking a picture at night as I’d forgotten to do it earlier in the day. I wanted to show the lovely patterns on the limbs of this tree that has lost all it’s bark (assuming it had some in the first place!). There are loads of trees like it. And bizarrely I haven’t stroked one yet to see if it’s as soft and smooth as it looks…..something to add to the to-do list. I forgot a photo again today!! So, am resorting to a second photo from yesterday. 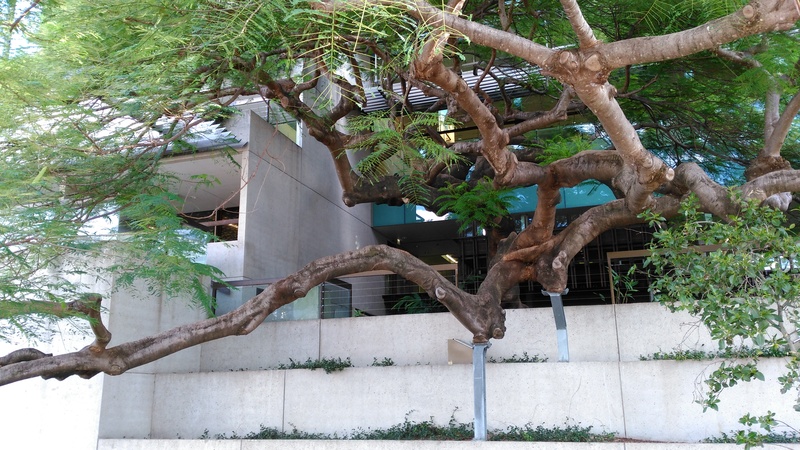 Whilst walking along the boardwalk over the river past the library and QPAC, we looked up at this tree……and how it’s meandering growth has been assisted by the addition of metallic supports. 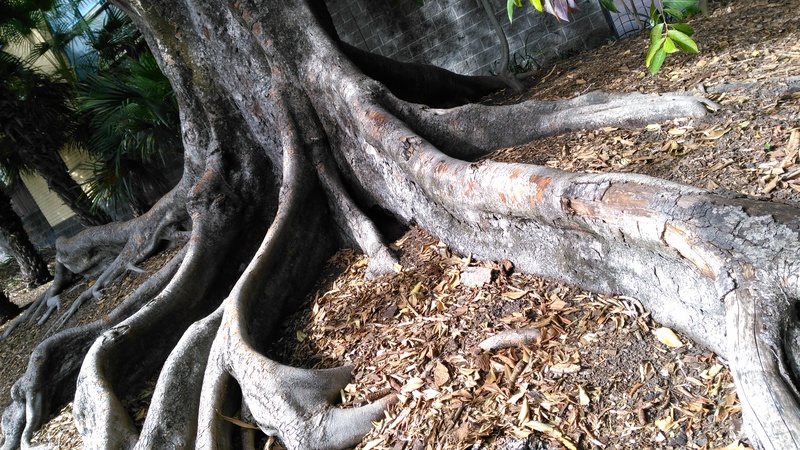 Whilst walking to a little lunch break with colleagues, I couldn’t help but think that this tree almost looks like it’s trying to show off just how far it’s roots stretch out. 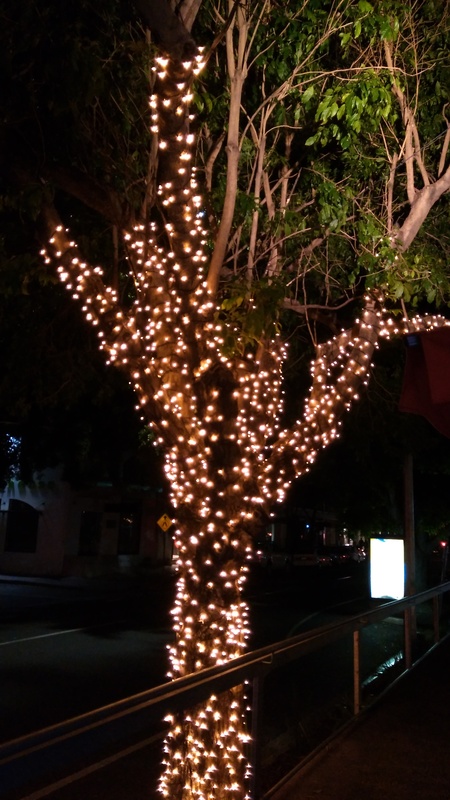 There are trees covered in fairy lights like this all over Brisbane. And I think they look really pretty. But, there is always a little part of my brain thinking…..it is an unnecessary use of power and resources. Anyone else have conflict like this when you see pretty but impractical things?